What gets me (something I’ve observed since well before my own pregnancy) is how all of this is forgotten – really quickly in some cases – and the pressure to ‘get your body back’ takes over. Flat stomachs and thigh gaps all round! Your body hasn’t *gone* anywhere. You’ve still got it! Ok, yes, it looks and feels waaaay different to before. But this will change (again and again over the course of your life, as a matter of fact) I promise you. It doesn’t mean you’ll always carry baby weight; although you might keep some curves. It doesn’t mean you’ll never wear skinny jeans again, unless you prefer a bootcut. And your days of bikinis on the beach are far from over, except if you don’t like beaches or bikinis. I’ve been reflecting on this a lot recently. I think our collective perspective has been skewed by the avalanche of confusing and sometimes shaming post-pregnancy information coming at us from all directions. From online forums, to click-bait articles, to unsolicited advice from friends and family, to beautifully curated social media posts… these often end up playing on insecurities instead of uplifting and supporting us during the incredible transition into motherhood. * Glossy images of impossibly gorgeous celebrity mums with washboard abs. * Health and fitness ‘inspo’ that plays on guilt instead of being genuinely inspiring. * Overwhelming programs and restrictive diets promising swift results to help you ‘snap back’. * You know, glamorous celeb mums are just being themselves, doing their job – for many, how they look IS their job; there’s no need to compare your experience with theirs. Many of these women have huge support (and pressure) to get them ‘back’ to where they were before baby. * Some people really love aggressive fitspo, it gives them the kick in the pants they want and motivates them to get moving. Not me (but that’s me!) I have a much more ‘softly softly’ approach, in my practice and life generally. * As for diet or health plans, these can be great for some folks who really thrive on the structure and support a program provides. However. It’s the combination – the constant stream of information and imagery filtering through numerous channels – that doesn’t seem harmonious to me. In fact, quite the opposite. It’s clanging and jarring and stress-inducing. For anyone, I would argue, but particularly newly-minted mothers. Just days before having my daughter at 42 weeks. 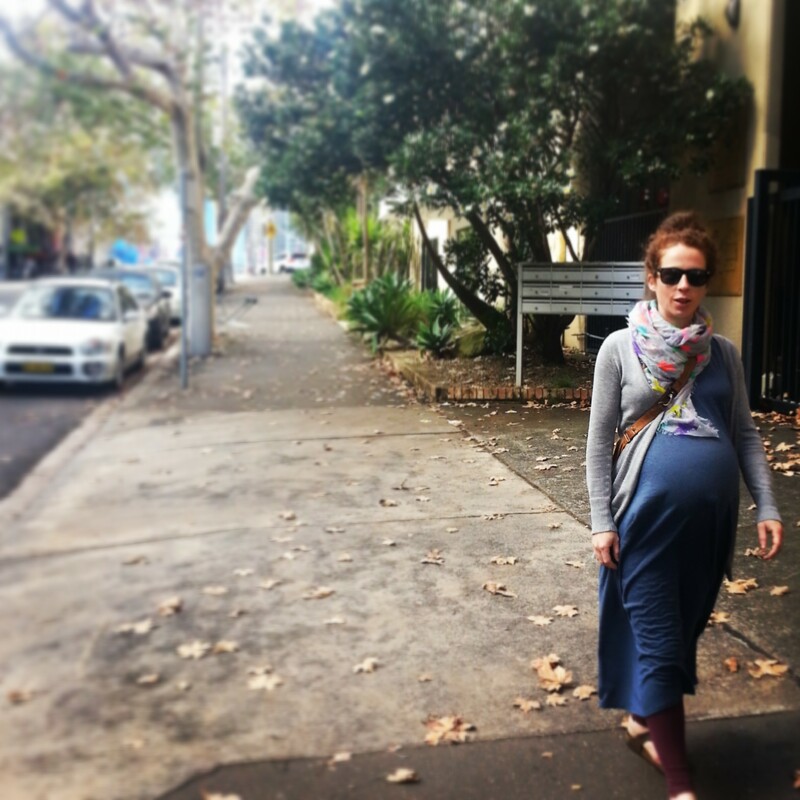 Feeling enormous and walking – or waddling – around our Sydney suburb, in an attempt to bring on labour. I’ve written before about how to nourish yourself (and increase your energy) with a newborn, and natural ways to support breastfeeding. Tell me. What’s your postpartum experience? How did or do you feel about your body after baby?